How do you know you have made steps toward learning decision-making and job search skills? I participated in a mentorship experience. I took a service-learning course or participated in a volunteer or service learning program. I have completed a mock interview at Career Services. I obtained a career position that is a fit with my interests, values and goals. I took the E-CHUG assessment in Counseling & Psychological Services. I attended a Counseling & Psychological Services workshop on self-development. I became part of a student organization that supports my personal and career interests. How can you work to develop self-awareness? I have taken all the self-assessments in Career Services to understand my skills, interests, values and personality. I have attended workshops at Counseling & Psychological Services. I have attended workshops at Career Services. 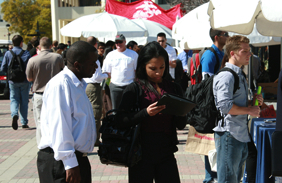 The 2012-13 academic year was the fourth year that Career Services offered Speed Networking with Professionals. Career Services worked with the College of Sciences and the College of Health & Human Services to create "Discovering Your Dream Career" at Scripps Cottage. The sell-out event was standing-room only and involved several employers and over 70 students.